Discover with us the beauty of Cilento - a creative week in southern Italy among nature, art, gastronomy and sport! Located on one of the most beautiful spots in the Cilento National Park, just a few miles from the sea, your holiday farm awaits! 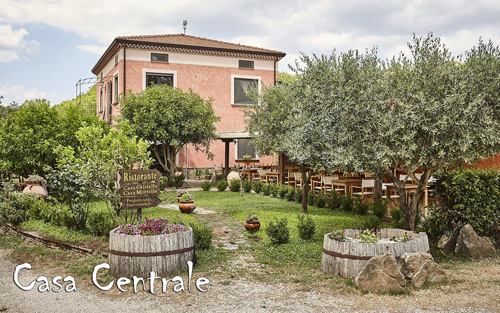 Surrounded by undulating hills and Mediterranean flora, this "agriturismo" is still a fully functioning working farm on 40 acres, producing organic quality olives and delectable goat cheeses. Everything is prepared by the family’s hands which have been working there for years with ever growing passion and knowledge. You can taste it in their conserves, the sweet and the salty, in their sausages, salami, goat cheeses, extra virgin olive oil, wines, liquors and honey. Your week will include 3 days of cooking classes and 3 days of riding. All levels of riding can be accommodated. Instructions in the arena for the beginner riders, a combination of instructions and trail riding for the rider with some riding experience, and for the more seasoned rider there will be day long trail rides into the beautiful Cilento Park. The main part of the farm consists of the old stables, which have been recently restored, a spacious and comfortable restaurant where you can try the best local food and regional wines, a little shop for the products from the farm and a small cheese factory where they produce their special goat cheese. The nicely furnished accommodations offer all the necessary comforts with lovely terraces and gardens, conveniently located by the swimming-pool and solarium for you to enjoy sunny days and a magical atmosphere. Easily accessible is the “National Park of Cilento”, the Amalfi Coast, Sorrento, Vietri, Positano, and you can reach Capri with the hydrofoil boat for a day tour. Some other destinations of interest for the traveler may be Ravello, Palinuro, and Camerota along the scenic coastline, Acciaroli, Castellabate, Velia and Paestum, Pompei, Ercolano, and Naples. Also nearby is the MAB-UNESCO reserve. The area has received several times the “Blue Flag” and the 5 Sails of Legambiente for the continuing high quality of its beaches and crystal clear water. Rates include*: Center based accommodations with private bath, half board (breakfast and dinner), picnic lunch on excursions, wine with dinner, 3 riding days and 3 days of cooking classes. Pick-up/ drop-off for this trip is from Vallo della Lucania-Castelnuov or Ascea train station for free or Naples International Airport (NAP) for an additional cost. Arrival after lunch. We will greet you and invite you for a welcome drink. Before dinner you will meet with your riding guide for the week to go over the itinerary. If there is still time, we will ride for an hour at the riding center to get acquainted with the horses. We leave Casal Velino and ride along Velia’s coastal route for about 8 km to the archaeological site of Elea-Velia where the Eleatic School was founded by Parmenides and Zeno. The Angevin Tower overlooks the ruins. We will leave the horses outside and make a quick visit to the archaeological site accompanied by an expert guide. We will then continue our ride through an ancient olive-grove of the “Pisciotta” variety, to join the path of the Ridge of the Gods, close to the terraces sacred to Jupiter. The path runs alongside the walls of the ancient village and is immersed in a beautifully preserved landscape where you can breathe in the typical scents of the Mediterranean scrub land. Another 10 km ride up to an altitude of 250 metres above sea-level where we can admire the exquisite landscape of the sea, the tower and the two gulfs of Ascea and Casal Velino. **less experienced riders can opt for instructions and shorter trails. The course of Cilento-Mediterranean cooking will prepare and present some of the typical dishes of the region. It is also possible to learn how to make bread and to participate in a guided tour to the mill to sea how different kinds of wheat are transformed into flour. You also get a little book with some of the private recipes so you can try it on your own once at you are back at home. We start lessons after breakfast. Claudia (your interpreter) will spend some time explaining what we are going to do and talk a little bit about the eating habits and traditions of Cilento. Then each person gets an "Moresani" apron which they can take home and we go into the kitchen where "Aunt Melina" our main chef is waiting to start. Don't worry, she has a lot of patience! Each person will prepare every step of the recipe while it is interpreted step by step in English. Each week is dedicated to different dishes but often we change it if guests have special requests. When we make pasta everybody has to start from dough, then make the stuffing and the sauce! Together you can decide to eat your dishes for lunch or dinner where Gino will offer you a bottle of wine. -we take you to a wine producer to taste different kinds of wines and show how it is produced. -in our cheese factory to see the making of our goat cheese and tasting it fresh. -to an olive mill (if in season) for the making of olives, you could also help with the picking. -in the restaurant for an analysis of extra virgin olive oil under the guidance of slow food member, who shows us how to distinguish good oil from inferior ones and how to use it in different foods. -to a mill for the transformation of corn into flour. If you are really interested in food and cooking, you will really enjoy this place because here you see everything from how the products grow and eventually are transformed into delicious dishes. We start out along the road that skirts the hills to the right of the agriturismo and ride 3 km to the small Church of San Giovanni (Saint John). The Church, which dates back to the XIV century, is thought to have been built by Basilian monks. Then on towards Celso (10 km from the departure point) which is completely immersed in the countryside, along tracks which allow you to fully admire the beauties of the Mediterranean scrubland (broom, bramble, heather, holm-oak, oak and sorb). We will enter Celso through the arch of Mazziotti’s Palace (now a national monument) which belonged to a Baron and a very illustrious scholar. Celso, an ancient medieval village dating back to 1050, was the scene of the events of the Risorgimento in Cilento which took place in 1828 and 1848. We then leave the village (418 m above sea-level) and ride on towards Pollica past a woods of young chestnut trees and then again through the Mediterranean scrubland that becomes the natural frame to the blue sea and spectacular coastline. We enter Pollica through a Franciscan Monastery founded in 1611 by Prince Capano. Along the streets of the town we can admire the typical stone portals and the 17th Century Palace Tower which dominates the village. We stop here for a picnic lunch. Morning cooking course - afternoon visit to local producers or free time to relax or organize a sightseeing tour. Available are guided tours to the archaeological site of Velia, interesting walking tours along the crest of the gods and the suggestive trails of Cilento passing through the ancient towns. Participating in bowshot (archery), swimming in the pool and also joining in the main rural works on the farm (picking olives, milking the goats, making cheese in our cheese-factory...) will make your stay interesting and pleasant. The farm is the ideal place for those who love open air sports. Nature is the real protagonist here, you’ll want to go hiking through the uncontaminated woods and the typical Mediterranean landscape or walk along beautiful trails and visit the medieval towns of the National Park of Cilento. The excursion can be started in the town of Montecorice, in the village of Cosentini, Ortodonico or in the town of Perdifumo. Starting from Cosentini you will pass through an area called “ Montanari” reaching the country road. Starting from Perdifumo instead, you will follow the crest of Punta Carpinia until reaching the equipped area of Monte Corbara. The path will bring you through a wooded area along the crest and offers many panoramic views. You will be able to observe “Mount Cervati”, the “Alburni”, Cape Palinuro, the gulf of Salerno and the Amalfi coast. This itinerary, which offers a landscape painting of rare beauty, also has a rich historical background. Along the way you will see the ruins of the “Castelluccio” and the Chapel of the “Madonna della Stella” whose cult dates back to the pre-Christian age. Walking down from Mount Stella, through a beautiful wood you’ll reach the so called “Vivaio”, an ideal place for some relaxing. This route is one of the best known in the area and follows the southern slope of Mount Stella. It starts in the panoramic town of Casal Velino following an easy path which offers you a splendid view on the country and takes you to the town of Celso. If you like you can take the ancient road through the green valley and along the stream Mortelle until you find a stony staircase that reaches Celso. From Celso, another panoramic path takes you to the convent of San Francesco and then to Pollica which has a well-preserved historical center and a small castle. This route is all down hill, passing through the village of Cannicchio, unchanged in all these years, and through a wonderful Mediterranean scrub until reaching the coast. The walk ends on the sea and along the streets of Acciaroli, a characteristic seafaring town. This route can be also started in the town of Celso, going towards the village of Galdo, or following the river as far as Pioppi where you can take a bath in its crystal clear water. Horses: Italian breeds. Sure footed and steady horses, the ideal mounts to explore the rugged countryside. Pace: The pace varies depending on the terrain and riders ability. 3-5 hrs of riding per riding day. You will find a stable of reliable and well trained horses who are the ideal mounts to explore the beautiful and rugged countryside. The pace varies depending on the terrain but you should be confident riding at the walk, trot and canter and also navigating sometimes steep ascents and descents. The Cilento is part of Italy´s most southern climate zone. However, even during the hot summer months (July and August) dry winds from the mountains are often blowing, creating a pleasant climate. Temperatures are mild in winter, too. The lowest temperature degree in the peak of wintertime is usually over 6°C/43°F. The highest temperature degree in the peak of summertime is usually under 32°C/90°F. Our partners can supply helmets. The farm is located in one of the most beautiful spots of the Cilento National Park. The panorama along the road is lovely and spectacular changing from the green olive trees to the blue sea ; the scents of nature are everywhere. The farm is laid out on 40 acres of private land. In a valley of oak trees, olives and wine yards you’ll find the riding track and riding school, the sheep-fold and pigsty. The main part of the farm consists in old stables, now restored; there is a spacious and comfortable restaurant where you can try the best local food and regional wines, a little store room and shop for our products and also a small cheese factory where we produce our own special goat cheese. To complete the farm there is a swimming pool (opens at the end of April) and two cottages with nicely furnished rooms or apartments and wide open spaces to offer you relaxing hours and freedom of movement. WIFI is only accessible near the restaurant. Laundry is available for 5 EUR. Different kinds of accommodations will satisfy every need of the guests: rooms and apartments all well furnished, spacious, and comfortable with private bathrooms and surrounded by a wonderful nature and beautiful view. Rooms come with a safe, air conditioning, kettle, hairdryer, and mini fridge. The accommodations offer all comforts, terraces, gardens, and are all nearby the wonderful swimming-pool and solarium in order to enjoy sunny days and a magical atmosphere. All double rooms can be converted into twin share with two standard single beds. An external staircase on the left side of the complex called “Casa Centrale”, leads to three separate accommodations: two double bedrooms and the “Bougainville” apartment. Both rooms have their own private bathroom with shower and hairdryer; they are also equipped with air conditioning and private safe. The rooms are comfortable, cozy and bright; each has a mini-bar and a kettle with everything you need to prepare yourself a tasty drink at any time. The external staircase leads straight down to a flower garden where you can sit under a pergola, sipping wine and enjoying the surrounding nature. This delightful apartment on the first floor of “Casa Centrale” is accessed via an external staircase which leads up from the agritourism’s lovely garden where you can sit and relax in the shade of a beautiful floral pergola. Bouganville is about 45 square meters and can accommodate a small family of up to 4 people as it has a double bedroom, a bathroom with shower (there is also a hairdryer), and a room with sofa bed and kitchenette. It is also equipped with air conditioning and a private safe and is a short walk from the riding school. 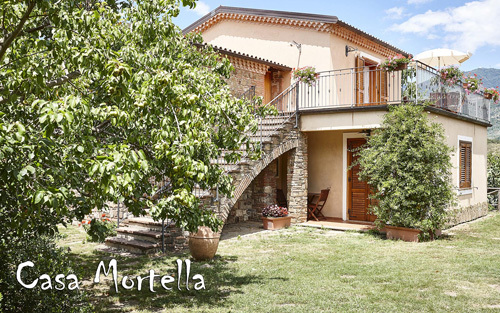 In the middle of the splendid nature right next to the pool stands Casa Mortella, made of local stone. On the inside there are three very comfortable double-rooms with mini-bar, safe, and private bathroom with shower. Each room has a separate entrance and two have a big terrace with panoramic view of the surrounding hills while the third room has an open space in front of the entrance overlooking the garden. In each room there is also a kettle so that guests can make themselves a nice cup of tea any time of day. There are tables and chairs on the outside of every room. 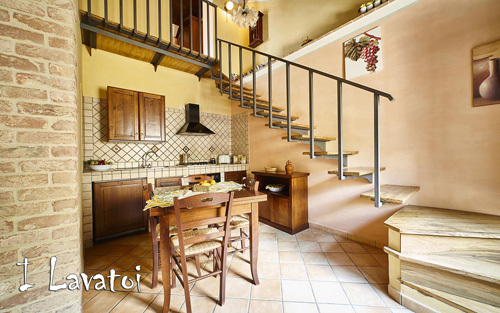 The upper floor "Il Corbezzolo" is an apartment bookable by a group. On the upper floor of Casa Mortella, there is an apartment called “Il Corbezzolo” ideal for a family of maximum four people. It is reached via an external staircase. It has a large bedroom with a splendid view on the hills, a bathroom with shower, and a kitchen. The children are accommodated on a rustic bunk bed. The large terrace overlooking our olive-trees will make your stay pleasant and comfortable and invites you to relaxing evenings, drinking some good local wine while enjoying the overwhelming quiet and the scents of nature. 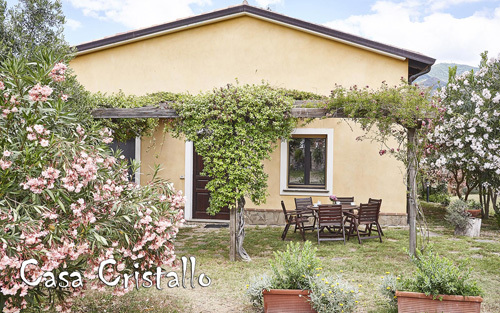 Right next to the swimming-pool among ancient olive-trees and Mediterranean scents an old farmer’s home has become Casa Cristallo and it still conserves a typical Cilento style. There are four comfortable double-rooms on the ground floor each with mini-bar and private bathroom with shower. Each room is equipped with safe, mini-bar and kettle so that you can make a refreshing cup of tea at any time of day and maybe drink it in the garden which surrounds the house, under the shade of an olive tree, and gaze at the enchanting nature that surrounds you. On the outside of the house there is a large open space equipped with table and chairs to enjoy some relax and the splendid view that surrounds our farm. The atmosphere is calm and familiar and assures you an unforgettable holiday. On the upper floor of Casa Cristallo there is a nice, comfortable country-style mansard. Comfortable and spacious (about 100 square meters) it has two double bedrooms and one triple bedroom (can sleep up to 6), a bathroom with shower and a spacious living room with sofa and kitchenette. This attic apartment also has an air conditioner, a safe and a washing machine. On the outside of the house there is a large open space equipped with table and chairs to enjoy some relax and the splendid view that surrounds our farm. The atmosphere is calm and familiar and assures you an unforgettable holiday. 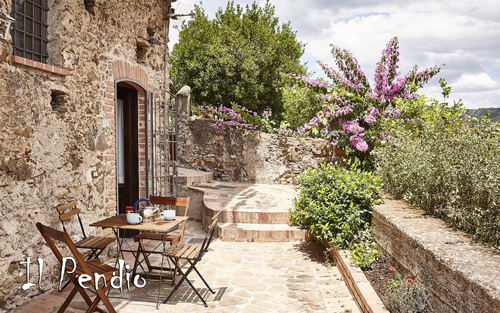 Casa Pendio is a small apartment in the center of Casal Velino; it offers independent accommodation whilst enjoying all the benefits associated with staying in an agritourism. Ideal for a young couple or a family with small children, this one-bedroom apartment has a large living room with kitchenette and sofa bed, separated from the mezzanine double bedroom by a stone arch. The bathroom is fitted with a shower and a washing machine. The small terrace at the front of the house, complete with parasol, wooden table and chairs, is the perfect place for al fresco dining. Altogether, the scent of the surrounding flowers and the views over the gulf, make for an unforgettable stay. On clear days you can admire a long section of the Cilentan coast stretching from Velia to Palinuro. Casa Pendio is just 1.5 kilometers from the agritourism which means that despite being an independent house in the heart of the town, it can also take advantage of all the services offered by the agritourism (use of the pool, half board option, free wi-fi connection, riding stables, participation in proposed activities and excursions, etc.). The house has no private parking but there is ample space for cars out front. Independent apartment in the historical center of Casal Velino right in front of the ancient wash-basins which used to be a meeting-point for all women of the town. The house has been refurbished in a rustic style and preserves its period wooden ceilings and furnishings. Distributed over two floors, it offers comfortable accommodation for up to 5 people: on the ground floor, at street level, is the front entrance; on the first floor is the living room with kitchen, a large master bedroom with balcony and a first bathroom; on the second floor is a bedroom composed of single bed and double sofa-bed served by a second bathroom. From this room you can go out onto the terrace which has a breathtaking view of the green hills to the left and the blue Cilentan sea to the right. The apartment is fully air-conditioned and equipped with a washing machine. Despite being external to the agritourism, the apartment enjoys all the services on offer to in-house guests (use of the pool, half-board option, free wi-fi, riding stables, participation in activities and excursions, etc). The house doesn’t have its own parking space but guests are invited to make use of the public ones just a few steps away. Breakfast, picnic lunches while on excursions, and dinner as well as house wine with dinner is included. Lunches when not on excursions are not included, but our restaurant offers a delicious variety. As we don't have a fixed menu, the price depends on how many dishes clients order and which kind of dishes. An average of € 30-35 per person per a complete menu (appetizer + first course + second course + side dish + dessert). 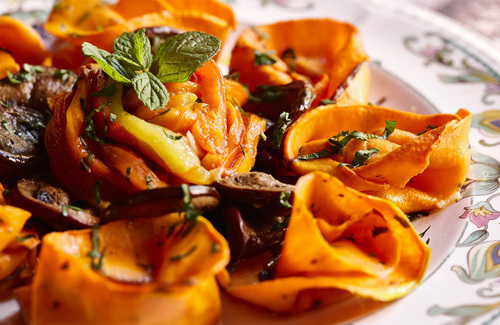 We offer our guests home-style dishes; most of the ingredients are made at the farm (hand-made pasta, vegetables, olive oil, meat, goat cheese, legumes, marmalades) and they are organic. Looking for the traditional ancient flavours is our unicity. Those flavours, often only a memory, are re-proposed by the family with an innovating taste. The wine cellar offers not only our excellent wine but also some of the best labels of the region Campania. A little shop inside the farm allows you to buy the self-made products such as the highly appreciated goat-cheese made in their own little cheese factory.